A man clears the debris from a destroyed convenience store in Rosalie, Ala., on Thursday, the day after a reported tornado struck the area. When weather conditions are just right — lots of rising heat and moisture, and vertical wind shear — sometimes you get more than just a tornado. Mathematician Michael Tippett at Columbia University, who tracks these outbreaks, says that while the number of tornadoes nationwide varies a lot year to year, the overall average is pretty steady. 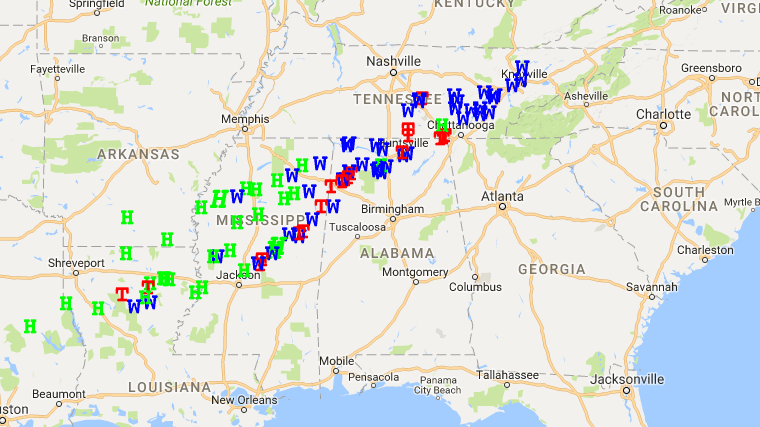 This map from the National Weather Service shows tornado reports (red T), wind reports (blue W) and hail reports (green H) for Tuesday. 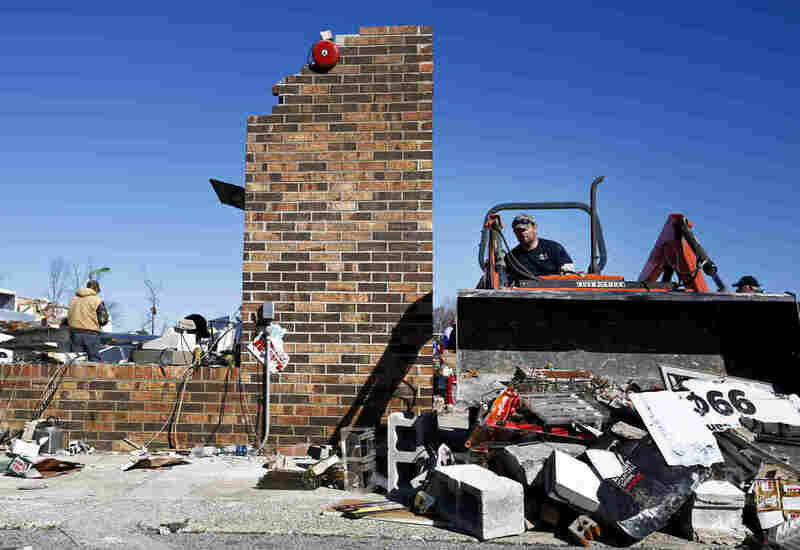 More than 20 tornadoes were reported as a powerful storm system moved through the Southeast. Zoom in on the map here. "But the number of tornadoes in outbreaks is increasing," he says. And the number of tornadoes in the most extreme outbreaks — those where at least a dozen tornadoes hit a region within one to three days — is increasing the fastest. Scientists who study climate suspect that warming temperatures may affect how many tornadoes we get. After all, warmer, wetter conditions are like priming the tornado pump. But Tippett says so far he is not seeing a connection between climate change and these bigger outbreaks. "It's not the expected signature of climate change," he says, "it could be either something else, or we really don't understand what climate change is doing." All sorts of things influence weather: for example, the circulation of warm water in the Pacific and Atlantic oceans. That circulation changes over decades, which in turn alters long-term weather patterns. Writing in the journal Science, Tippett says those ocean changes could be implicated here, but there's no evidence yet. The only thing that seems to be changing are certain kinds of wind patterns near these clusters — when wind at different elevations is blowing in different directions (wind shear), for example. No matter what the cause, these bigger outbreaks hurt people in their path. This week's killed five. And they affect the insurance industry. Bigger outbreaks usually mean more damage, and more payouts.